Bank's long-term deposit and senior debt ratings were lowered to Aa3, the fourth-highest level, from Aa1, and its bank financial strength rating to C+ from B. In its report, the rating agency said the banks faces risk from "continuing preponderance of capital market activities" and the "ensuing challenges for risk management." The outlook on all ratings was citied as 'stable'. Earnings from the investment-banking unit accounts for more than two-third of the total earnings. 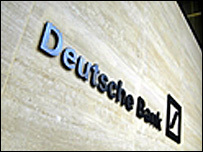 Deutsche Bank AG said last month that tax breaks in the US and rebound in stock market worldwide helped propel its earnings to $1.8 billion in the fourth quarter of 2009. Deutsche Bank lost more than a $1 billion from bad bets on bonds hedged by CDS in the September-December quarter of 2008 when the bank posted its first annual loss in more than 50 years.